This scanner is monitoring the entire market for trade opportunities for all symbols and for all time frames. You don't have to look to all the charts, for all symbols and for all time frames. This scanner will alert you on your computer, or on your mobile, when a trade opportunity has been found. You never have to miss a trade opportunity! This indicator is designed to scan all pairs and symbols, for all time frames, to find a cross of the MACD main and signal line. The MACD is used to follow trends. 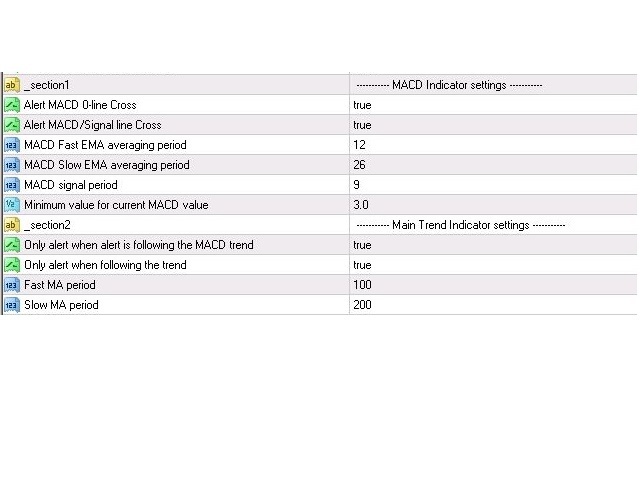 The MACD is calculated as follows: 12-period EMA - 26 period EMA (default values). The MACD signal is the EMA (9 days) of the MACD line. The most important signal of the MACD is when the MACD crossed the signal line up or down. This gives us a signal that a trend might be emerging in the direction of the cross. Note: This indicator will not show information on the chart. This is a scanner and will provide reliable MACD trading alerts. The MACD strategy is to trade when there is a cross of the MACD and Signal line. However, you do not want to act on every signal. You will be most successful when you follow the trend. Signals will be filtered when it is not following the MACD trend. E.g. If the MACD is below the zero line, no Bullish alerts will be issued. The scanner has an embedded trend filter, to only provide signals following the trend. It will filter signals if the MACD value is low. If the MACD value is low, it means that the 12-period EMA and the 26 period EMA are close to each other. In this case, there is no strong trend, and you don't want to trade in this condition. Like for every indicator, the higher time frames are more reliable then shorter time frames. For that reason, the recommendation is to use the scanner for high time frames only (H1 or higher). Do not enter the market when high critical news is expected the same day. High critical news can result in unexpected movements in the market, which can not be identified by any indicator. News can be found on e.g. the MQL website, DailyFX and investing.com. Do not enter the market when the price is close to an important support or resistance. 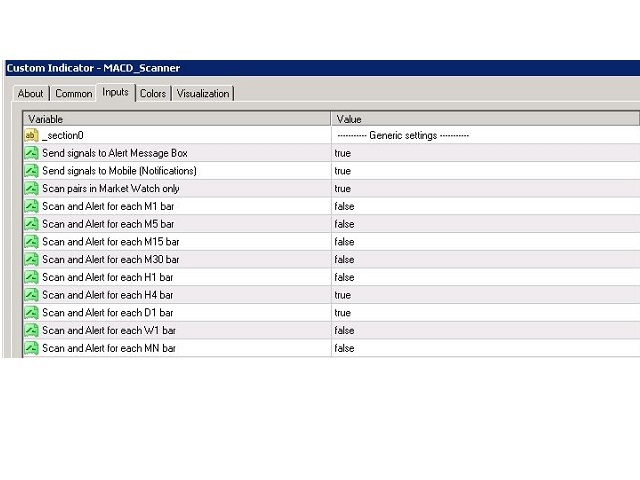 Scans all symbols visible in your Market Watch window, or all symbols available for your broker at the same time. Indicator only have to be installed on one chart to scan the entire market. Specify which time frame you want to monitor. Each time frame can be selected in the settings. 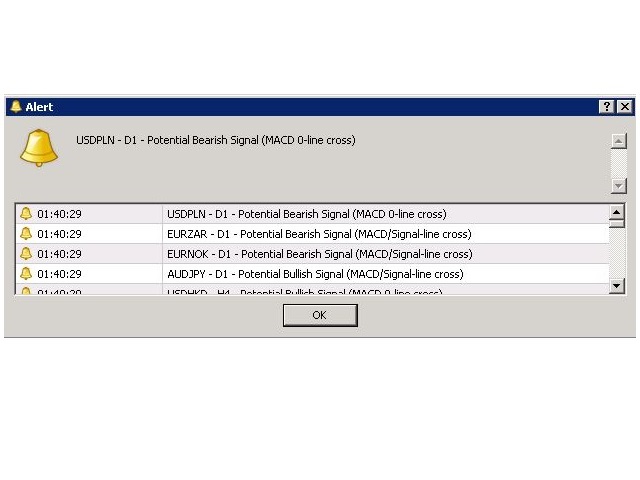 Receive Alerts in the MT4 terminal for each trade opportunity found. Receive Alerts on your mobile phone, so you never miss a trade opportunity! Download the Indicator in your MT4 terminal after you have purchased the product. Put the indicator on one chart in your MT4 terminal (any chart can be used, any symbol and time frame can be used), and from that moment the entire market will be scanned for all pairs and symbols, and for all time frames as configured. Only alert when following the trend: If True, only receive alerts if the MACD signal is following the main trend of the symbol. The trend is defined by MAs. Resolved a bug related to symbols with prefixed.